The student activity fee on every student’s college bill has raised questions among the campus community as it appears every semester, and nobody knew what the fee encompassed. Set by the Vermont State College System at $131 per semester for fulltime students attending Lyndon State, Castleton University, Community College of Vermont, Vermont Technical College or Johnson State, the student activity fee is estimated at the beginning of the semester, and totaled around late February. This money is distributed to the Student Government Association (SGA), Student Led Activities Programming (SLAP), and non-work study employees that fall under these umbrellas, including the Badger Bullet drivers, the Morrisville bus drivers, SLAP and SGA staff, Director of Student Activities, Community Service, and Student Government Association Krista Swahn and the Dibden crew when they assist in SLAP events. 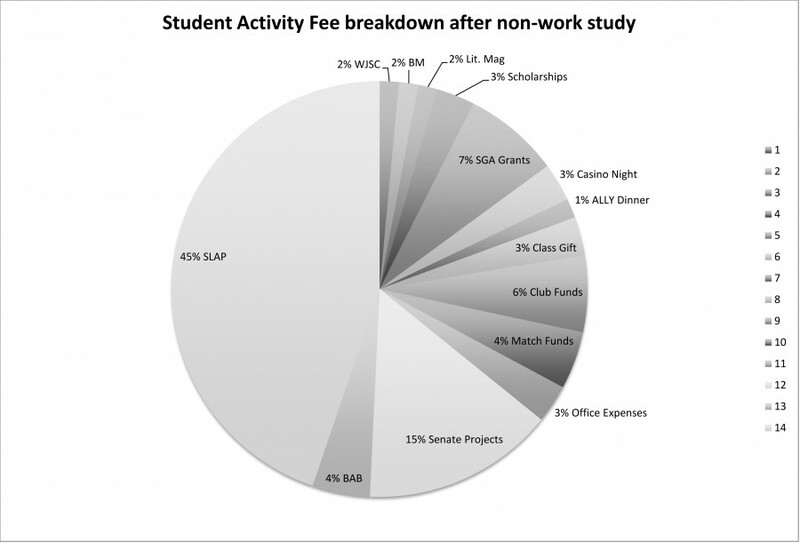 After money from the student activity fee is distributed to non-work study employees, the rest is split with 55 percent going to SGA and 45 percent going to SLAP. This year, the SGA’s estimated budget is $36,000, which SGA President Nasser Abdel-Fatah has broken down based on last year’s suggestions as well as the budget he used during his former presidency in 2013. The line items, which are set things that the SGA always pays for, are as follows: $1,000 to the campus radio station (WJSC), $1,000 to Basement Medicine for printing costs, $1,000 to the campus literary magazine, $2,000 toward four $500 scholarships to be awarded to students for conferences and trips, $5,000 to SGA grants, $2,000 to Casino Night, $1,000 to the ALLY Dinner, and $2,000 toward a class gift. The line items total $15,000. The other $22,000 is broken down into funds and expenses including $4,000 in club funds, $3,000 in match funds, $2,000 for office expenses, $10,000 to Senate Projects, and $3,000 in scholarships for Badger Alternative Break participants to offset the fundraising and trip cost. Club funds and match funds are two items that go together. Match funds is an initiative that SGA started about 5 or 6 years ago. If a club raises $300, for example, the SGA can use these funds to match what the club raised. Club funds are dollars that clubs can request if they are starting a club and come up short. Some colleges require clubs to compete for this money, but JSC works on a first-come, first-serve basis. This budget has been presented to and approved by the SGA senators as is, but they had the opportunity to give suggestions before the vote, if they saw a need for a change. According to Abdel-Fatah, this year the senate didn’t have any suggestions. The SLAP portion of the budget from the student activity fee is used for all SLAP programming, as well as to co-sponsor large campus events with other departments, such as speakers for some of the themed weeks on campus like Alcohol and Drug Awareness Week. If any of the money from the student activity ee is not used by the end of the year, it doesn’t disappear. That money rolls over as a cushion for the following year. This also means that all of the clubs will start the following fall with whatever they ended their budget at in the previous semester. The cushion that the SGA had from last year, Abdel-Fatah used to bring John Brown’s Body to campus, and then disbursed the rest into other items in his budget, including B.A.B., which used to be an item, but was removed a few years ago. If there are any further questions regarding money and the budget for SGA, contact the new SGA treasurer Shelby Rosten in the SGA office. The budget is also posted year-round in the SGA office for anyone who wants to view it. For questions regarding the SLAP funds, contact Swahn.